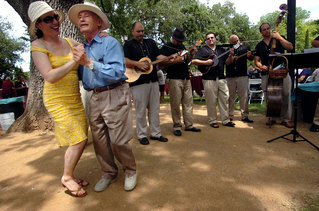 Food, arts, crafts, music and dancing highlight 25th year. Kristina Susac was 19 and worked as an intern for a radio station when she decided the small Croatian community in Sacramento could do something big. She helped organize the Croatian Extravaganza, a two-day festival that celebrates Croatia through music, dancing, food and camaraderie. The plan was to raise awareness of Croatian culture -- and money to build a new Croatian American cultural center, said Susac, now 43. "In school, people would say 'I'm Italian,' or 'I'm Greek' or Mexican and when I would say, 'I'm Croatian,' the response would be, 'What is that?' " she said. The festival, now held at the Croatian American Cultural Center on Auburn Boulevard, marked its 25th anniversary on Saturday and Sunday. More than 5,000 people attended from throughout the region and the Bay Area. Many were ethnic Croatians, including some who emigrated to Sacramento in the 1940s to escape communist rule. Others came to the festival to learn about Croatia, which has become a top tourist destination in recent years. Festivalgoers mingled over hefty plates of potato salad, apple and cheese strudel, grilled pork, lamb and chicken. Vendors promoted Croatian arts and crafts. Dancers in white and red peasant dresses entertained the crowd from an outdoor stage. The festivities were centered on a Mediterranean-style building within a 2 1/2-acre parklike setting. "It's a beautiful atmosphere, there are never any problems and it's a strong tradition," said Miho Simunovic, who attends the festival each year to sell his Croatian art. Iva Vukman, of the Croatian National Tourist Office in New York, came to the festival for the first time this year to promote the country as a tourist destination. Since the country declared its independence from Yugoslavia in the 1990s, she said, Croatia has had major improvements to its infrastructure and has attracted more tourists. The country known to some as the "alternative Riviera," has seen a 20 percent increase in U.S. tourists this year and recently was ranked as one of the top destinations in the world, Vukman said. The draw has been Croatia's beautiful countryside, historic buildings and more than 1,000 islands along the Adriatic Sea across from Italy. Organizers of Sacramento's Croatian Extravaganza have worked to educate people about the beauty of the country and its people. The Croatian American Cultural Center opened in 1992 and has been a place for community events, weddings and meetings. John Susac, an event organizer and former president of the center, said the community bonded to build the center, raising $600,000 through the annual festival to pay for materials and donating labor to construct the facility, he said.